White Dragon Paper handmade paper and journals. Announcement A wide selection of handmade, recycled papers for writing, printing, bookbinding, crafting, and decorative uses. Leather and hard cover journals with recycled handmade paper pages. Custom requests are most welcome. 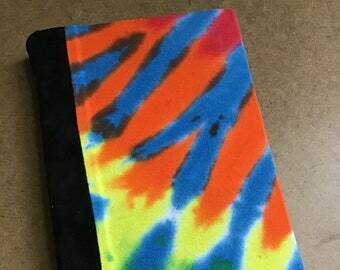 Click the blue "Request Custom Order" button on the left side of the screen to ask about making a custom size, color, or style of paper, book, or envelope. I'm happy to make you something special! Ohio residents will be charged 7.5% sales tax at checkout. A wide selection of handmade, recycled papers for writing, printing, bookbinding, crafting, and decorative uses. Leather and hard cover journals with recycled handmade paper pages. Custom requests are most welcome. Beautiful and excellent quality. Quick delivery. Thank you!! AWESOME product and unbelievably helpful service!! Most definitely will purchase again. Perfect gift for any occasion. Journals ready to be sewn. My leather is sourced from the scrap bin of a local leather supply store. 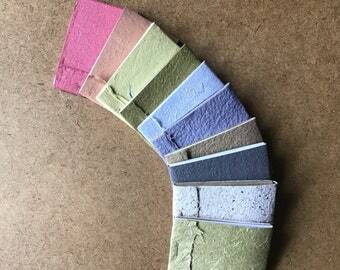 I make a variety of colors of handmade paper. From the basement to a wet, pulpy mess. And I LOVE it! This all started one summer when I got bored and found a "How to" article about making paper. Soon enough, the fresh sheets started taking over my shelves. I hated to see them recycled just when they had been given a rebirth into new sheets of paper, and I couldn't use them quickly enough by myself. I started this Etsy shop thinking maybe someone, somewhere would have a use for them. Well, it's been a few years and a LOT has changed, but I still love making paper just as much as when it was just a hobby in my basement. Now White Dragon Paper has become a major source for high quality handmade papers for both US and international artists, writers, Do It Yourselfers, and crafters. I cater to both the small-batch crafter or artist and to the large-scale printer or designer that needs a steady wholesale supplier to continue their work. White Dragon Paper prides itself on using recycled, eco friendly fiber and reducing the amount of paper waste that goes into landfills each year. I personally, and White Dragon Paper as a business entity, are dedicated to giving back to the community by volunteering, donating time, supplies, or money as able/needed, and by supporting other small businesses and local artists. Making paper is a meditative process for me. There's something very relaxing to the simple, repetitive movement. The end result of having a crisp, clean sheet of paper opens endless possibilities. 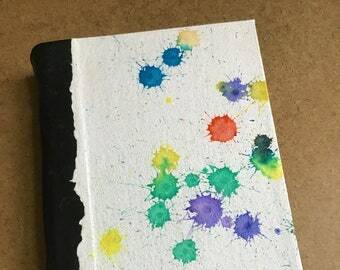 Anything that may have been upsetting or stressful before just melts away after I open up a whole world of opportunities with that one simple sheet of paper. Currently I am based in Columbus, Ohio, USA. White Dragon Paper, LLC is owned and operated by a single person. R. Lawton holds a bachelor's degree in Geography, focusing on the interactions between environment and society, and has been making recycled paper and books since 2008. Rick is my go-to guy for 3D printed paper making tools. White Dragon Paper focuses on recycling and using natural ingredients to create handmade paper and stationery products.